Just got an E-mail from Steven at Computamaps who has posted a fabulous 3D model collection representing most of downtown Vancouver in 3D . 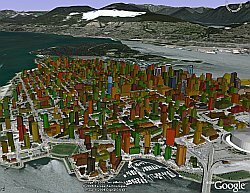 You will need to use Google Earth 4 Beta to see these models as they are not only colorful, but some of the buildings are textured with more details. According to Steven, the model collection has over 5000 objects, but the size of the download is only 1.2 Mbytes. They have fully modeled the Science World building, One Wall Center, Morris Wosk (site of GeoWeb 2006 where they are officially announcing this new model collection), and many more. Steven says this model collection "shows off the power of combining SketchUp and GE to render the urban environment." Computamaps also modeled the recently released downtown Cape Town in 3D. Great work guys! Anybody can begin creating 3D models using the free Google Sketchup and upload them into Google Earth or the 3DWarehouse. Keep it up, the rest of the major cities of the world will gradually be made availabe in 3D as well. This looks great. The different colours remind me of the SimCity a few years ago (green for residential etc). Perhaps someone will write a similar game using a real world city? One of the best cities in the world to live, if not the best. I lived in Vancouver for some month in 2006. I LOVE THE CITY and the surroundings. Great place to be! You have here an interesting website, I hope you will be posting more. thanks for sharing!